Chicken soup is a great source of healthy, easily digested calories, with heaps of added nutritional benefits. At the first sign of sickness, your body will be working overtime to fight off infection, and this takes energy. 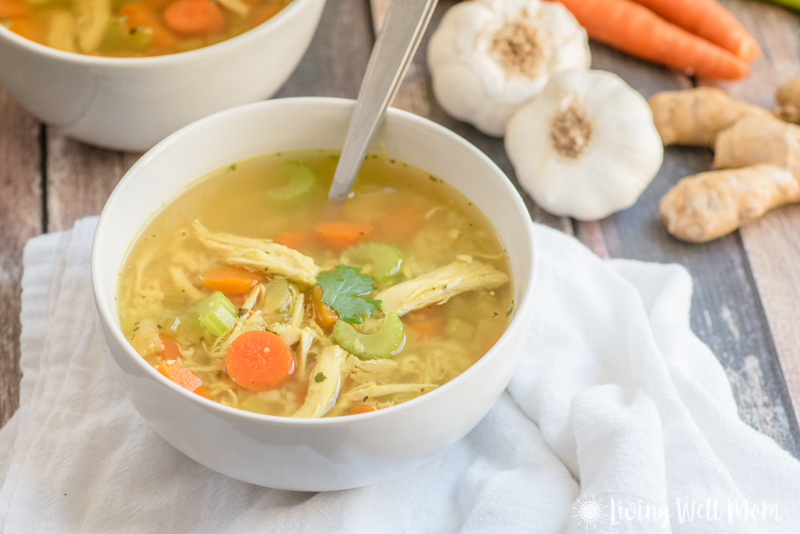 Chicken soup benefits you by providing necessary nutrients back. Some doctors believe that the soup’s benefits are mainly psychosomatic, that it’s the ultimate comfort food. Others say the steaming hot soup clears congestion and provides the body with necessary hydration to flush out viral bugs. Let’s see all reasons why chicken soup is good when you are sick here on this page. A scientific study found that chicken soup has anti-inflammatory properties. In particular, it relieves congestion by reducing the movement of white blood cells in the upper respiratory tract. Eating chicken soup when you have a cold helps because you’re breathing steam, which loosens up congestion. You are also hydrated, as we need at least eight glasses of fluid a day when we are sick. And you are not taking antibiotics, all the right treatment for simple upper respiratory viruses. The steam from chicken soup helps relieve a congested nose and throat. You can add ingredients in a chicken soup including onions, garlic and additional vegetables that add flavour and a healthy dose of phytonutrients – vital for a well-functioning immune system. They can also help to reduce inflammation in the body, which in turn may help to ease the symptoms of a pesky cold. Keeping our digestive system healthy is especially important when we’re sick so that our bodies are able to absorb all the infection-fighting vitamins and minerals it needs from the food we eat. When cooking bones with joint tissue on them (like necks, knuckles, ribs or the leftover carcass from a roasted chicken) the joint tissue cooks down and dissolves into the broth. The gelatine, glucosamine and chondroitin contained within are released into the broth, absorbed by our bodies and used to repair and rebuild our own connective tissue while reducing inflammation, helping you to get back on your feet faster after a bout of illness.